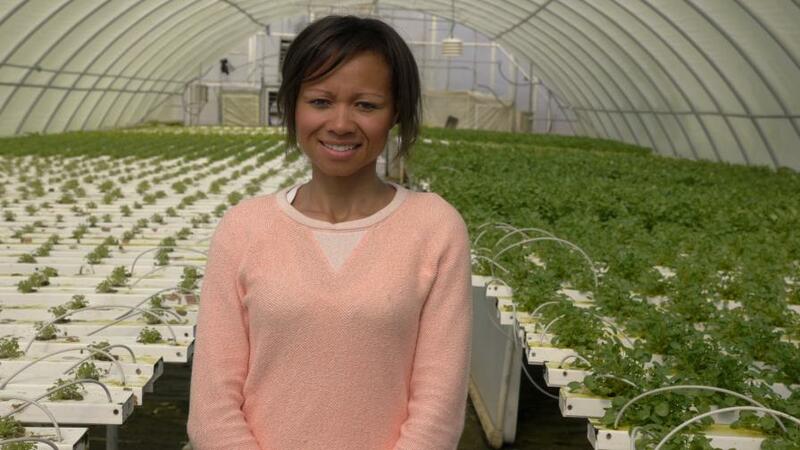 Tinia Pina, founder and CEO of agtech startup Re-Nuble. “Agriculture requires a different type of investor. One who understands the time needed for user adoption and in-field learning as plants need time to prove results as companies need time to prove scale,” she said. 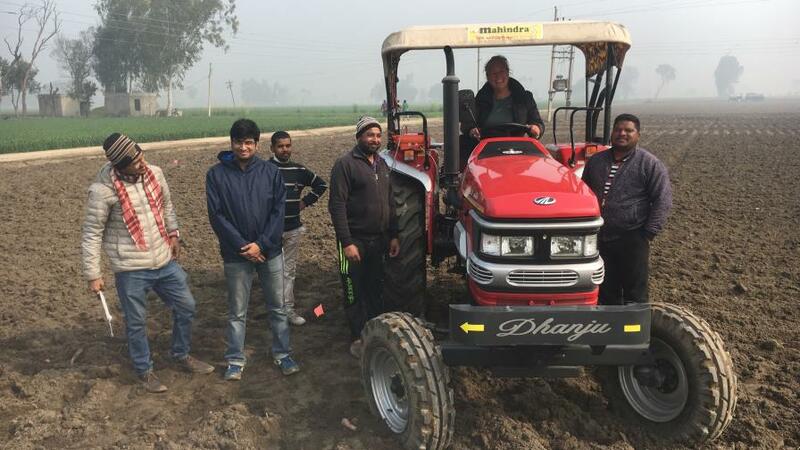 To be sure, VC investor AgFunder reported that $10.1 billion went into agrifood tech investment all the way through the supply chain, but only a small percent went to women-led agtech companies. Within the $10.1 billion, investment in farm tech was $4.2 billion. In many ways agtech isn’t an anomaly. In 2017, women-led startups across all sectors combined received $1.9 billion of the $85 billion total invested by venture capitalists, according to PitchBook, a data research company. That’s a scant 2% of what went to men. Penelope Nagel (in cab), COO at Persistence Data Mining. Penelope Nagel the COO at Persistence Data Mining, a San Diego-based agtech startup and member of THRIVE IV Accelerator cohort, said the funding issue stems from a sector that isn’t known for rapid changes. While she is a ninth generation farmer, Nagel said women leaders have traditionally been an anomaly in agriculture with farms run by men and passed down from fathers to sons. At Persistence Data Mining Nagel said it was part of the company’s strategy to make her COO and tap Brian Zamudio as CEO. Zamudio is the company’s largest investor but “to be honest with you it is easier to fundraise with a man,” Nagel said. Agtech as a sector is also relatively new as growers continue to come to terms with adopting new technologies that aim to make their yield more efficient and cost-effective. Nagel said she’s used to being an anomaly and notes a lot of the women she sees in agriculture are in marketing or legislation. In other words, the image of the female farmer continues to seem foreign to many. Growing up in the family farm “Nagle Farms” in Mt. Auburn, IL, she is a fourth-generation farmer woman. “I get out in the field with a pair of boots,” Nagel laughs. Funding success often depends on the CEO herself, said Pam Marrone, the founder and CEO of Marrone Bio Innovations, a NASDAQ-traded company with the tagline `Bio With Bite’. Marrone has been a mentor and sounding board to numerous women who have launched agtech companies including Redmelon and AgShift. She now is a mentor for fledgling companies participating in the THRIVE accelerator. “It’s about the characteristics of the entrepreneur herself — how strong they are at pitching and instilling confidence and getting a team around her and never letting up in pursuit of the vision and mission,” Marrone said. But not all is negative. Rob Leclerc, CEO and co-founder of AgFunder, said he’s seeing some silver linings. To be sure, five out of eight of AgFunder’s portfolio companies were founded by women and four have female CEOs. These include Trace Genomics, Kinova, Gingko Bioworks, ImpactVision, and Brightseed. On an even more positive note, some of the companies such as Trace Genomics are currently closing on large rounds of funding. Sofia Elizondo, the COO and co-founder of Brightseed, said she believes gender helped her in a positive way as she and her two co-founders (both men) fundraise. During the fundraising process, Elizondo was pregnant and found that she connected with male investors on a personal level as they discussed children; Leclerc and his wife were expecting a child around the same time and he and Elizondo traded advice. “I don’t know if we would have raised more money if I wasn’t pregnant though,” Elizondo muses. Leclerc’s observation is that there will be more women-led agtech companies down the road as the sector tends to attract women with solid backgrounds in STEM (science, technology, engineering, and math) and those with a passion for making a difference in society. “Fundamentally, women might care more about health and the environment,” Leclerc said. Pina said fundraising challenges can be eased with some tweaks. Not only should there be more women-led agtech companies but more female investors at all investment stages, she suggests. “By having a higher representation within the investment community and those that serve on the Board of Directors on agtech companies, resources can be funneled to these companies sooner and create more market comparatives to show proof points to prospective investors,” she said. Brightseed’s Elizondo said there remains a tendency to gravitate towards people who are similar, whether it be educational or social. “The challenge is to make unconscious bias conscious so ultimately investors can make better investment decisions,” she said. AgFunder’s Leclerc said it will come down to investors who might consider taking a step back and “making more effort to be mindful of their own biases.” When AgFunder invests the mindset is simple and doesn’t involve gender. “We said let’s go and invest in the best entrepreneurs,” he said. The women entrepreneurs we spoke with agreed. That is the way it should be, they said. 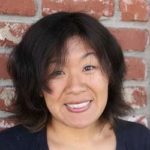 Amy Wu is the founder and chief content director of “From Farms to Incubators,” a resident company inside the WG Center for Innovation and Technology. She previously reported on ag for The Salinas Californian. She considers herself bicoastal and splits her time between New York and California. See all author stories here.